The fine arts program at Charlottesville City Schools infuses our schools with enrichment and experiences that encourage artistic expression at all grade levels. Here are just a few of the recent arts-related events and accomplishments we are celebrating. Congratulations to our musicians who represented Charlottesville High School in the 2019 All-Virginia Choir, Bands, and Orchestra at the Richmond Marriott and Convention Center; culminating performances were held at the Carpenter Center. Pictured left to right, top row: Adria Cafferillo, Choir; Reid Dodson, Symphonic Band, Parker Nelson, Choir, Margaret Ann Doran, Choir, and Anna Bon-Harper, Symphonic Band. Seated: Sarah Garretson, Orchestra. 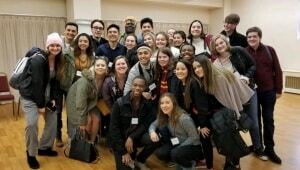 TheatreCHS students just returned from New York City where they participated in the Broadway Theatre Group Hamilton Summit. Students enjoyed two days of acting, dance, and vocal workshops with cast members from “Hamilton.” They will also visit the Upward Citizens Brigade Improv Club and saw “Hamilton” on Broadway in the Richard Rogers Theatre. Click here for news coverage of their trip. Portrait by ninth-grade CHS student Emily Morris featured in the 2019 ArtConnections exhibit. 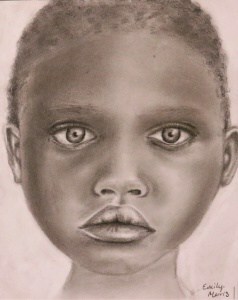 The annual division-wide ArtConnections exhibit featured student art from across the division. Two evening open houses which included performances by the Walker and Buford School jazz bands gave the public an opportunity to celebrate the many talents of our kindergarten through 12th grade artists. A Saturday celebration attracted more than 600 visitors and featured hands-on art activities including letterpress printmaking with visiting artist Amos Paul Kennedy, Jr. Printer Amos Kennedy shows CHS art students how to make a letterpress print. 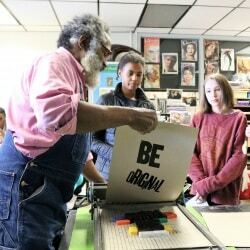 Amos Paul Kennedy, Jr. also conducted several letterpress workshops at our schools and other places in the Charlottesville-area as part of his “Finding Wisdom” residency with Virginia Humanities’ Virginia Center of the Book. Charlottesville High School art students got to make their own prints using their own words of wisdom. 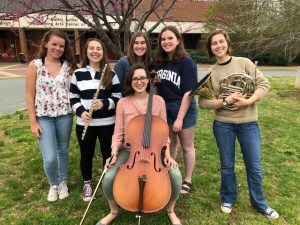 Congratulations to the following CHS musicians who earned selection by competitive audition for the 2019 All-Virginia Orchestra and Band: Senior Sarah Garretson placed third chair cello in the All-Virginia Orchestra while junior flutist Reid Dodson and senior horn player Anna Bon-Harper were selected for All-Virginia Band. Meanwhile, the CHS Concert Orchestra earned all “Superior” ratings and nearly straight A’s in all subcategories for their stage performance at grade 5 and also earned “Excellent” for sight reading. 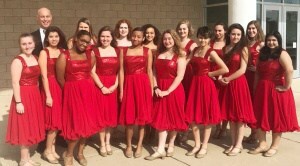 The Knightengales, Charlottesville High School’s all female ensemble, earned all Superior ratings at the District 13 Concert Assessment. Congratulations to (pictured left to right) Lolly Lynch, Anne Boura, Al-Nisa Utz, Casey Casarez, Emily Webber, Emma Harrison, Renee Lyons, Kyla Rose, Bobbie Jo Fassler, Eliza Smith, Sylvie Bowman, Courtney Snapp, Ceci Becker, Parker Nelson, and Esmerelda Lopez. The troupe recently performed with other Charlottesville-area women’s ensembles in a concert benefitting The Shelter for Help in Emergency. 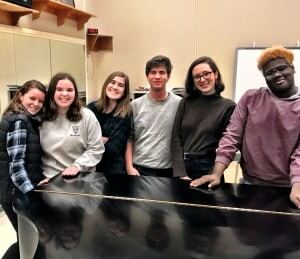 Congratulations to the following CHS choir students who earned positions in this year’s All-Virginia Choir to be held in Richmond in April: (pictured left to right) Adria Cafferillo, Margaret Anne Doran, Parker Nelson, Eoin Sprinkle, Sarah Garretson, and Javier Fortune. Meanwhile, the Buford Middle School Symphonic Band was one of three middle schools in our district to receive unanimous Superior ratings at District 13 Concert Band assessments. The band is now preparing to travel for their spring trip to the MUSICALE Festival in Williamsburg, Virginia in April. 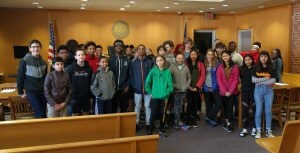 Buford eighth grade students visit Charlottesville District Court. Buford Middle School 8th grade Civics and Economics classes visited Charlottesville District Court where they got to see what they are learning about in the classroom in real-time action. Thanks to Judge Downer, the court clerks, members of the Sheriff’s department, and the Commonwealth’s Attorneys for giving our students this valuable educational opportunity. The CHS Black Knight Debate team hosted the VHSL Regional Debate Tournament which included schools from Blacksburg, Danville, Bedford County, Salem, and Sherando. CHS won first place in the Sweepstakes, and the following students will advance to Super-Regionals in April: LINCOLN-DOUGLAS- Dani Szabo (1st), Ellie Detert (4th), and Alex Ralston (5th ); PUBLIC FORUM – Lena Keesecker & Talia Sherman (3rd) and John Emery & Maisie Fischman (4th). 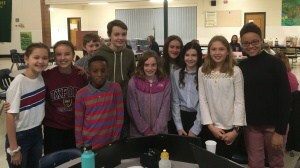 Walker students in Mrs. Scheiber’s 6th grade Language Arts classes participated in the Charlottesville League Debate competition at Jack Jouett Middle School. They had to debate the topic, “The benefits of zoos outweighs the harms.” Congratulations to this group of first-year debaters which includes the following teams: Olivia Wade and Cyrus Wyatt, Zoe Kershner and Sela Knight, Evan English and Robert Scott, Naia Downs-Reeve and Maya Butler, and Elle Polifka and Ellery Long. All teams won at least one out of three rounds of competition and special recognition goes to team Cyrus and Olivia for winning two rounds, and to Sela, Cyrus, and Olivia for receiving outstanding speaker points. Mohammad Haidari receives award for winning first place in the American Legion Post 74 writing contest. Congratulations to the following CHS students for being selected as winners of the Tupelo Press Mirabella Poetry & Prose teen writing contest. These students were invited to read their works at the area awards ceremony held at St. Anne’s-Belfield School: “pale-lunged” by Rachel Beling, “Al Hudaydah” by Kiran Klubock-Shukla, “A First Goodbye” by Cassie Hersman, and “The Radioactive Ghost of Kilkenny” by James O’Brien. Their writings will be included in an annual anthology of teen writing which will also include “The Evil Lake” by Lily Deleo, “Hope” by Mathew Farina, “A Father” by Ari Pyle, “Warmth” by Robin Guziejka, “Our Soldiers” by Colin Saint, and “Our Sweet Sensations” by Nyah Catherine-Lim. 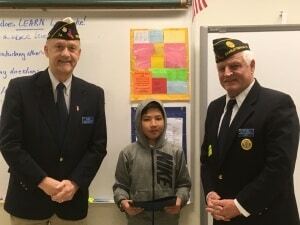 Sixth grade Walker student Mohammad Haidari won first place in District 13 in the American Legion Post 74 writing contest. He received a certificate and check for his essay, “I Like Living in America Because…” and moved on to the regional competition. Using a generous PTO grant that funded 20 point-and-shoot digital cameras, students in Rachel Wilson’s photography classes at CHS visited Clark and Johnson Schools to teach elementary kids the basics of digital photography.